Note that device detection is an optional feature in Ektron. You can disable it at any time by simply setting the content of the value attribute to false. More information on disabling WURFL in Ektron can be found here: http://portal.ektron.com/KB/10742/. By clicking on View Account you will be redirected to the page that contains links to the WURFL binaries and WURFL Snapshot files. The WURFL Snapshot contains the information about devices that would let your Ektron code to serve intelligent markup to requesting browsers. The data is available in two formats: ZIP and GZ. From an API perspective there is no difference at all between the two formats. Choosing one over the other is a pure matter of preference. You do not need to download both files—either ZIP or GZ would work. The downloaded file, whether GZ or ZIP, must be copied to the App_Data folder of your Ektron installation. 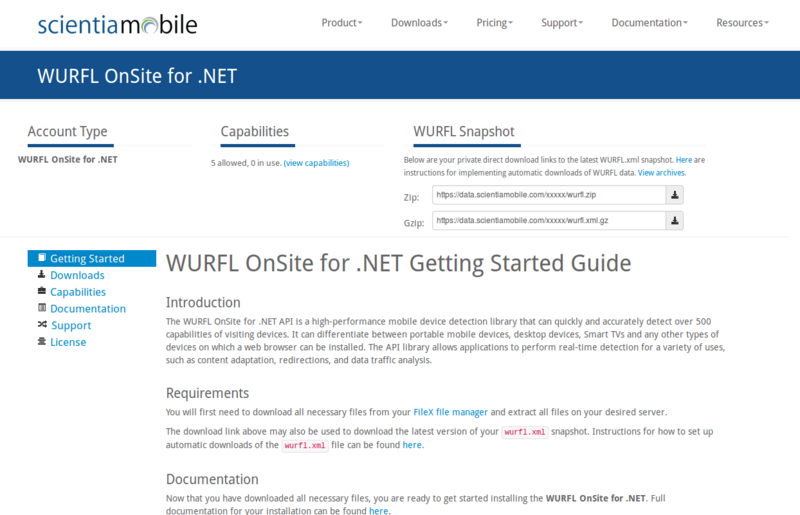 NOTE An updated version of the WURFL Snapshot is released weekly on Sunday night. In case of significant improvement to the data, however, out-of-band updates are still possible. You are responsible for getting fresh files and updating your App_Data folder. There is no strict need to apply updates on a regular basis; that is mostly up to you and updates can be scheduled at your convenience. The link for downloading fresh files is made available in your View Account page or you can automate the process. Downloaded binary files must be copied to the Bin folder of your Ektron installation. The Customer Vault lists all of the most recent releases of the WURFL library. In general, you should pick up the most recent one. Scala Meet WURFL. WURFL Meet Scala.